PanARMENIAN.Net - As many as 5600 people die of cancer in Armenia each year, which means the disease is the second leading cause of death, including of premature death following heart disease, the Health Ministry revealed Wednesday, April 10. Cancer prevalence grew by 27% from 2012, with 8389 new cases diagnosed in 2017, up by 6%. 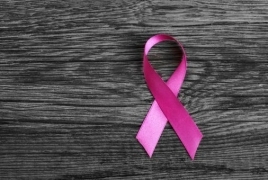 Given the importance of the problem, the ministry said it is planning to not only increase the financing of cancer diagnosis and treatment, but also introduce a national strategy to fight cancer. Within the Armenia imPACT Review mission, representatives of the World Health Organization (WHO) and the International Atomic Energy Agency (IAEA) have advised the Ministry in the process of development and implementation of the National Strategy for the Prevention of Cancer. The International experts have met with the staff of the Department of Health Care Policy of the Ministry and are planning discussions with field specialists, as well as visits to institutions providing oncology services. According to WHO predictions, the number of new cases of cancer worldwide could reach from 12 million to day to 27 million by 2030, while deaths could rise from 8 to 17 million.